The week continued to be full of action at Earls Hall! Following on from their walk of the local area earlier on in the week, the children from Year One used their writing plans to begin to write a recount of the route they took, the landmarks they saw and any events which took place along the way linked to Traction Man’s heroic actions! Meanwhile, in Robins, some children noticed that it was a bit windy outside so set to work in the creative area of the classroom in order to make their own kites using paper and string. Once they had created their masterpieces, they went out in the Early Years garden and tested them in the breeze. Down the corridor, in Dormice, the children continued to learn about Chinese New Year and worked together to create a series of Chinese dragons. Some children coloured and cut outlines of dragons heads whilst others created their own using cardboard boxes. Upstairs in Elm the children continued to investigate the British Isles by pinpointing towns and cities on maps whilst downstairs Madame Bass held a series of French lessons across the classes in KS1. 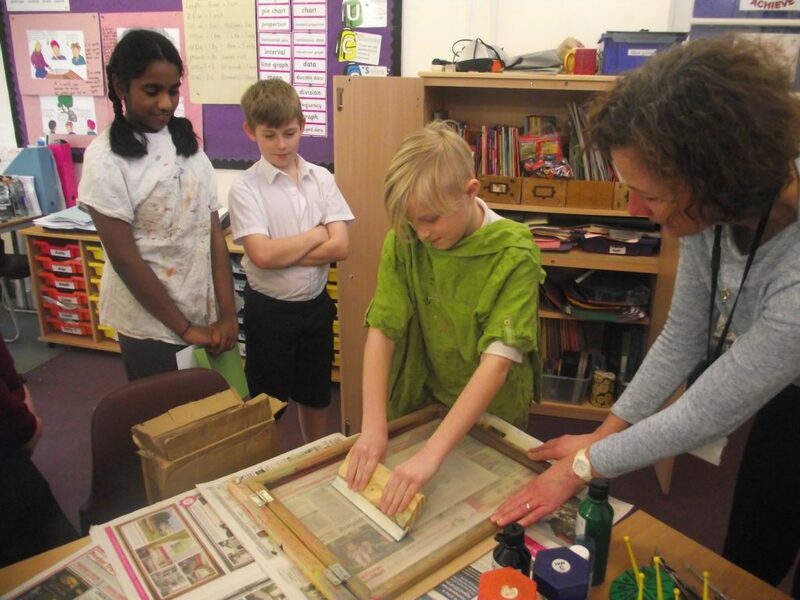 The smell of printing ink was evident in both Year Three and Year Six this afternoon. The children in Year Three used polystyrene and rollers in order to create mono prints based on cave art whilst the children in 6J created screen prints of their WWII propaganda posters.